DST has extensive experience in the identifications, management, and abatement of equipment and wastes containing polychlorinated biphenyls (PCBs). DST has also been working to educate our clients on the latest regulatory changes in Canada. Revised federal PCB Regulations came into force in September 2008, imposing deadlines for the destruction of all PCBs and PCB-containing material currently in storage, and requiring the phase-out of PCB-containing equipment. Along with deadlines for the elimination of PCBs in storage, the regulation has set interim requirements for labeling and annual reporting. 1. December 31, 2009: all equipment containing PCBs in a concentration of 500 parts per million (ppm) or more (excluding pole-mounted equipment and light ballasts). 2. 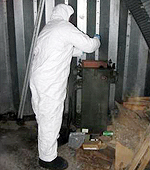 December 31, 2009: all equipment containing PCBs in a concentration of 50 ppm or more at any sensitive location, including within 100 meters of drinking water treatment plants, food and feed processing plants, child care facilities, preschool, primary and secondary schools, hospitals, and senior citizen care facilities (excluding pole-mounted equipment and light ballasts). 3. December 31, 2025: all equipment containing PCBs in concentrations of 50 ppm or more (including pole-mounted equipment and light ballasts). This regulation applies to anyone who owns or manages PCB liquids, PCB waste, or PCB-containing equipment, including building owners, managers, school boards, federal, provincial and municipal governments, etc. Reviewing PCB management practices and phase-out plans to ensure your facilities are in compliance with the regulations. DST can also provide you with a full range of consulting services should PCB contamination be suspected in a building or on a property, including sampling (swab, liquid, building material, soil, etc.) and remediation supervision.